As I was going through old magazines, I saw this little brain exercise (not sure if it was Reader’s Digest). I thought it would be fun, but it’s proving really, really, reeeeallyyy hard. 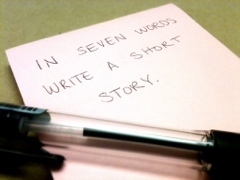 I looked up elements of a short story and narrowed it down (in order to keep in line with the seven theme) to setting, characters, sequence, exposition, conflict, climax, and resolution. Even with that, it’s still too complicated for me to even try! 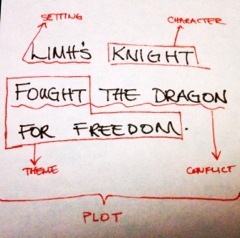 And so, with much (not really) debate, I’ll narrow it even further to plot, character, conflict, theme, and setting. I’m no English major, plus, I have a subpar understanding of grammar (thanks for stripping me of my confidence, grammar nazis), but I think I managed to come up with something. I don’t know how they come up with a short story in seven words when it hardly encompasses a resolution to the plot. Or maybe I’m just over thinking this fun exercise. Well, anyhoo, that was pretty neat. In fact, my mind is already thinking up a more complicated story. Why was the knight fighting the dragon? Is the knight a male or a female? Was the dragon evil? Where is Limh? What color was the knight’s armor? I think I’ll create a series of posts for this little exercise. Perhaps I’ll even start drawing a larger picture for some of these.